Existing emissions data and air quality monitoring data. Potential effects of air pollution on human/animal health, and related air quality modeling results. The proximity of Elk Island National Park. The proximity of the City of Edmonton as a pollution source. Our Airshed includes several counties and the communities of Fort Saskatchewan, Gibbons, Bon Accord, Bruderheim, Lamont, Redwater, Waskatenau, Thorhild and Elk Island National Park. Highway 834 is the eastern boundary. The southern boundary follows highway 16 to Edmonton’s city limits. The western boundary follows the city limits north and west to Highway 28. The western boundary continues north following Highways 803 and 651 to Highway 661. The northern boundary runs through the hamlet of Newbrook, approximately 88 kilometres northeast of Fort Saskatchewan. FAP reached a significant milestone in 2000 when we were officially recognized as one of Alberta’s 10 Airsheds. In 2003, we began reporting air quality data from a collection of monitoring stations that had been independently operated by industry. Since 2005, we have implemented and expanded a passive monitoring network to better understand air quality throughout the region, and worked with Environment Canada on a large Volatile Organic Compound study. At the time, the most significant improvements to the monitoring network involved identifying redundant monitoring stations and redeploying monitoring resources throughout the Airshed. 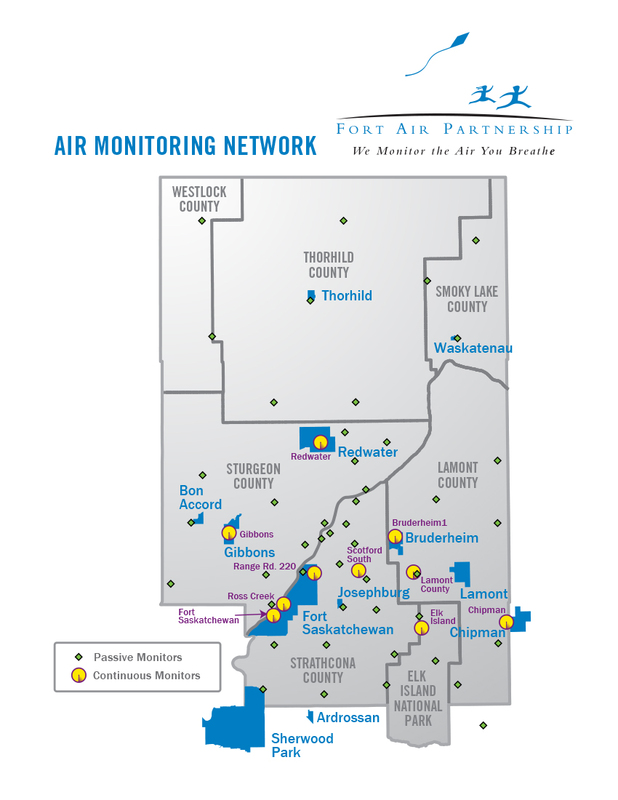 In 2010, Fort Air Partnership redefined its air monitoring objectives to support the regional approach to monitoring adopted in Alberta. A comprehensive third party network assessment was done to determine how best to meet these objectives. In 2013, the FAP Board approved a new regional network air monitoring plan that has changed the way air quality is being monitored within the Airshed. The changes are resulting in a better understanding of the impact of all emission sources on air quality, not just those that are regulated. A regional air monitoring network offers stakeholders more benefits and responds better to community, government and industry needs. As part of the plan, a new air monitoring station in Gibbons was added in February, 2016, a station adjacent to the Agrium Redwater facility was moved to the Town of Redwater in October, 2017 and a portable air monitoring station was added in April, 2018 to the network.